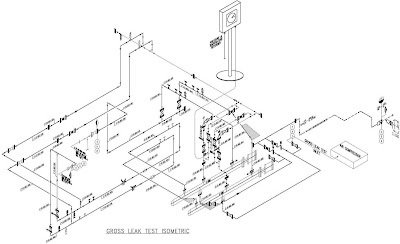 Gross Leak test adalah pekerjaan yang dilakukan untuk melakukan test kebocoran pada sambungan flange. Pekerjaan ini dilakukan setelah selesai pelaksanaan hydrotest, setelah hydrotest semua spool selanjutnya masing2 pipa spool dirangkai menjadi satu kesatuan menjadi line service yang utuh. Ketika proses penyambungan antara flange dimungkinkan ada kebocoran pada gasket, inilah tujuan dari gross leak test. Gross leak test menggunakan media udara dari kompresor untuk nantinya diinject kedalam line pipa yang sudah siap. Selotip kertas ditempelkan pada masing2 sambungan dan diberi lubang dengan jarum untuk nantinya disemprot dengan air sabun sehingga dapat mengetahui apakah sambungan tersebut bocor atau tidak (dengan timbulnya gelembung berarti bocor). Pressurenya cukup 7 bar atau lebih kecil apabila tekanan operasi dari pipa kurang dari 7 bar. a. Follow test packs with Mark up PID's and sketches showing test limits line-up & isolations. c. Prepare and assemble the gross leak system and ensure all port connection are tied in good condition. d. Install tape to flange joint connection & make small hole to check with soap during test. e. Pressurize the sub-system line to 7 barg (or below if the maximum operating pressure of the sub system is lower) by using air. f. Test result shall be carried out by visual inspection using soapy water and test pressure measured by calibrated pressure gauges..
g. A certified calibrated BARTON recorder will be installed. h. Observe and Commence checking flanges, valve gland packing, vent plugs, etc., for identification of leaks using soap solution. Pull-up flange bolts, etc., as required. If necessary, change gaskets or packing (after de-pressuring the system). i. The test will be continued for at least 1 hour, preferably during daytime when ambient temperatures are relatively steady. Pressurizing shall be hold until all the sub system line are inspected and accepted by CTR QA/QC and CPY Authorized Commissioning Teams. j. Following a successful test, de-pressure and reinstate the sub-system line by remove temporary blinds (if any), reinstall all the removed items which were required by sub-system, reposition of permanent spectacle blinds, including all others necessary works.